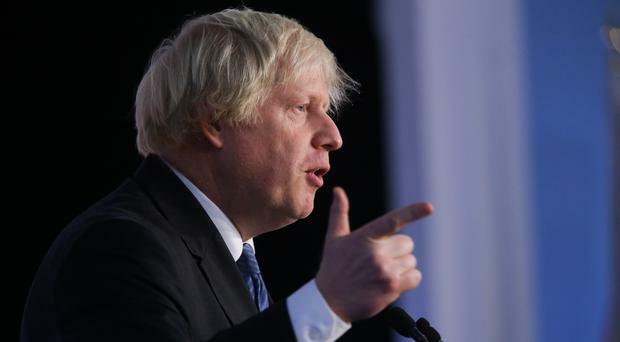 Boris Johnson said the UK is on the brink of an "historic mistake" - comparing Theresa May's Brexit plan to the Titanic heading toward disaster. The former Foreign Secretary was speaking at the DUP conference in Belfast, where he demanded the scrapping of the Irish border backstop. "The Titanic springs to mind, and now is the time to point out the iceberg ahead," the Tory MP said. "This deal risks further economic and political humiliation. "Nowhere has a more illustrious history than Northern Ireland when it comes to the creation of recreational watercraft. "The Titanic springs to mind. "And now is the time to point out the iceberg ahead." Mr Johnson, who was guest speaker at the annual DUP gathering, also stressed the need for the Tories to protect their faltering confidence and supply agreement with the DUP amid ongoing Brexit uncertainty. He echoed DUP calls for the Prime Minister to bin the proposals that could see the region operate under different regulatory rules to the rest of the UK after Brexit. "Unless we junk this backstop, we will find that Brussels has got us exactly where they want us - a satellite state," said the Tory MP. The leading Brexiteer warned that the draft Brexit deal is in danger of turning Northern Ireland into an "economic semi-colony" of the EU. By Benjamin Kentish Any hi-tech solution to the problem of how to keep the Northern Ireland border open after Brexit is at least 10 years away, a leaked Home Office document has said.